EyeforTravel Europe is 6 weeks away and what a show it’s going to be! Mobile innovation and the internet’s control of the consumer, integrating voice into your business, a smart customer journey, how the death of cash in travel will change the industry forever are just a handful of market opportunities you should be considering today… and this conference will help facilitate this change. With speakers from Airbnb, Hilton and Booking.com covering the macro questions we all want answered, Hostel World, Edwardian Hotels, Rail Europe discussing next steps of AI, to Hotels.com and Hotel Tonight discussing loyalty and NH Hotels, Expedia talking about the partnerships you need this is the event to be at. Whether your interest is smart hotel rooms, open source APIs or firming up your ancillary strategy, this is the one event which unites practical people in the industry who are building new travel architecture that revolutionizes the industry and creates profit. Want in? With a bigger and better agenda, it’s now three days and boasts big hitting keynotes, three topic specific tracks, a hackathon, a start-up village and dedicated workshops for B2C brands to attend! If you are looking to get face to face with over 450 of Europe’s leading travel brands comprising heads of mobile innovation, technology, marketing and innovation from Europe’s biggest transport, hospitality and travel brands looking to meet for one goal … identify the strategies, partnerships, innovations and business models that will make their companies thrive in the future. Then there’s options for you. Ways you can bring your brand to the event is through sponsorship opportunities, they have limited booths available and currently have a final discounted ticket price for you to attend. So, what are you waiting for? Need help making a decision you can request the attendee list here. A mixture of active debate, insightful presentations and 1-2-1 networking will be at the heart of this year’s conference. Get your hands on one of their discounted passes today! Hotel brands are seeing lower satisfaction rates from their mobile efforts according to EyeforTravel’s new report, likely as a result of not being able to reach guests as effectively as other verticals through the channel. As part of EyeforTravel and SAP Digital Interconnect’s new Driving Intelligent, Interconnected Mobile Engagement Throughout the Travel Journey report, an industry survey asked whether mobile messaging services were effective at driving satisfaction amongst customers. While 72% of hospitality and accommodation brands said that their messaging services were effective, a much higher 90% of respondents from other travel industry verticals reported success through messaging. But why is this? The report points out that one potential explanation is that hospitality brands are utilizing the most personalized and effective elements of messaging channels to a lesser degree than other verticals. This is leading to them not getting the maximum utility out of their messaging services and not building up the same relationship with their customers than other companies surveyed. The research finds that although hotel brands are good at pushing booking confirmations and welcome/check-in messages to travelers, they fall behind when it comes to more complex and data-reliant messages. Hospitality brands are using push notification at half the rate of the rest of the sample (35.3% versus 16.7%), despite 31% of accommodation companies having an app, and are way behind for upsell notifications, with just 32.3% of messaging-capable hospitality brands sending personalized upsell messages versus 51.2% for the remaining respondents. They therefore have less ability to become useful to the consumer and implant themselves with travelers as a trusted source of local information. Hospitality brands low deployment of push-notifications is illustrative of this mismatch, as push notifications were found by the survey to be by far the most effective form of in-app advertising. Push notifications were chosen as the most effective form by 44% of respondents, followed by display banners at 25%, videos at 15%, native display at 14% and interstitial at 3%. Therefore, without these capabilities, hotels cannot communicate. Hospitality and accommodation companies therefore need to build up their technological capabilities in order to reach out to consumers wherever they are with relevant and targeted messages. 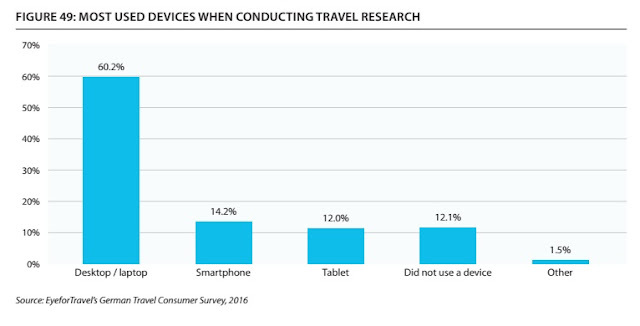 A major industry survey of all travel verticals uncovering their mobile strategies and technology deployments. Analysis of how consumers are using the mobile channel. Projections for mobile’s growth across travel. Where you should be investing to reach the mobile consumer. How you can ensure mobile-focused communications are effective. An overview of how you should be measuring and overseeing an m-commerce operation. Dates have been finalized for the EyeforTravel North America 2018 Summit, set to take place on Oct 18 – 19, at the Mandalay Bay Las Vegas. This year marks the 20th anniversary of North America’s largest commercial travel summit covering distribution, travel technology, data analytics, revenue management, marketing, partnerships and much more! To be the first to hear about the 2018 event agenda launch and speaker line-up, click here. A sneak peek of the brands confirmed to speak include Wyndham Hotel Group, United Airlines, Amazon, Allegiant Air, Skyscanner, Jet Blue Technology Ventures, Caesars Corporation, Cosmopolitan Las Vegas and Palace Resorts. Pre-launch discounted conference passes (as low as $1299) – if your dates are locked in, book your pass now at a highly subsidized rate. Passes are fully transferrable and can be cancelled up to 6 weeks prior to the event. Ps. The EyeforTravel Start Up Awards is also back for 2018! Full details on the Awards, Awards process, and subsidized registration fees can be found here. Do not miss your chance to join some of travel’s most inspiring and innovative brands coming together for two days on Oct 18th and 19th 2018 in Las Vegas– this is the only place you will learn from and network with travel’s elite, with the main goal of getting business done and pioneering change in the industry. More and more markets are becoming mobile-first, giving brands huge potential to reach out to travelers, but EyeforTravel and SAP Digital Interconnect’s new free mobile market report finds that brands are missing out by failing to reach consumers on their smartphones. Creating a mobile messaging strategy is effective, so why aren’t more brands doing it asks EyeforTravel and SAP Digital Interconnect’s new Driving Intelligent, Interconnected Mobile Engagement Throughout the Travel Journey report? The research, which is free to download now, shows that 83% of travel brands that have automated messaging services find that they are effective at increasing customer satisfaction. However, just 41% of brands surveyed report that they currently have these services, although a further 20% report that they are also developing the capability to do so. Delving deeper into the deployment of possible mobile messaging routes, a similar story emerges of a lack of communication routes between brands and travelers. Just under a third of brands reported that they had developed an app, 29% could reach customers with mobile messaging or push notifications and just under a quarter can send SMS texts. This leaves the majority of travel brands bereft of ways in which to communicate directly to travelers’ smartphones, aside from through email, but even in this field, only 40.4% of respondents said they use mobile-optimised email. This mismatch leaves a huge gap that is increasingly vital for travel brands to exploit. The research notes that not only do travel consumers increasingly resort to mobile as they research their trip and as they journey, but also they are actively interested in being reached. 87% of US travelers said that they find travel notifications useful, with trip status updates the most popular but also discounts and pricing widely sought after. Therefore, travel brands are missing out on better performance in two ways says the research: Firstly, they are largely unable to cross- and upsell the consumer travel products, as well as less able to accommodate last-minute mobile bookings, hitting revenue directly. Secondly, they are missing out on a key means to drive loyalty with the consumer, as smart mobile messaging allows a relationship to be built. This latter point can be done through a number of ways, such as making the customer’s journey more convenient, sending personalized messages, responding appropriately in moments of crisis, and creating an easier means to gather feedback and encourage reviews. However, to make the most out of mobile, it isn’t enough to simply deploy an app or an SMS service. Travel brands need to create an overarching mobile strategy. “For the traveler, there are no mobile stages. Mobile is everything and everything is mobile. We interact in making our purchase decisions seamlessly on our tablet and phones, and sometimes on our computers, so it is no longer fair to call out mobile as a separate category. It is no longer a case of ‘do you have a mobile strategy?’ Instead it’s ‘What are you doing to embed that deeper into the consumer lifecycle or purchase journey?’ says Rohit Tripathi, general manager and head of products, SAP Digital Interconnect. Tripathi also notes that this needs to be contextual and appropriate to the consumer’s situation. “If it’s a general update or information about an upcoming promotion that is not immediately relevant, then email is the best way to reach out, or social media. If it is something critical that needs to be acted on, such as a change of travel plans, an unexpected disruption or threat, then SMS is clearly the way to go. You can safely rely on SMS to be available globally whether or not the person has a data plan,” he explains. In an era of digital transformation, companies that master data and analytics can outgrow their rivals and boost loyalty among customers. This is a wide-ranging task, however. They must trace travelers through virtual space, build leading-edge data science teams, create rich customer profiles, optimize revenue and personalize pricing. It’s a time for innovation, but not all the rules are clear. Disruptors abound in the industry taking advantage of technological developments, such as blockchain technology, which was a growing area of interest at the Summit. New privacy rules are taking effect, and data breaches can significantly damage even the foremost travel brands. 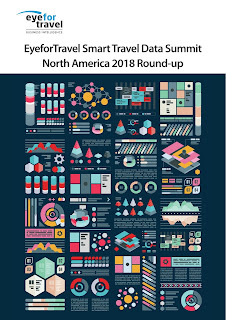 EyeforTravel’s Smart Travel Data Summit NorthAmerica, held in Miami on February 27th and 28th 2018, delved into data-driven insight through insights from top executives from Amazon, Expedia, Airbnb, Southwest Airlines, Hyatt, Wyndham Worldwide and Delta Airlines among others. To find out what they were talking about, click here to download the full Round-up report now. Companies with advanced analytics are five times more likely to make decisions before their industry peers, said Priti Dhanda, director of revenue management analytics for Hyatt Hotels Corp.
Over the next five years, about USD800 billion in revenue is expected to shift to the 15% of companies that get personalization right, said Stuart Greif, a former Microsoft executive who now leads the travel and hospitality practice for Amperity, a Seattle software firm that is disrupting the industry with its “intelligent” customer data platform. 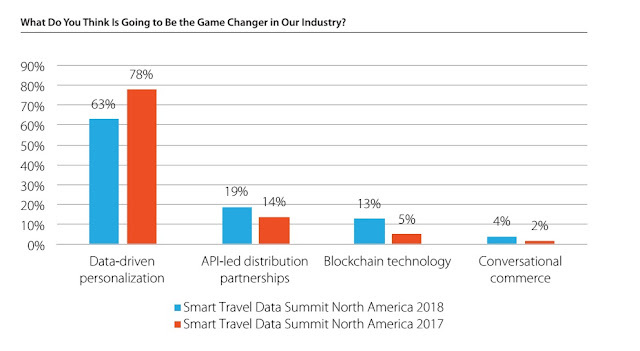 The audience also agreed, with data-driven personalization thought to be the most important game-changer for the industry, chosen by 63% of the audience polled at the event, although this slightly lower than at the 2017 Smart Travel Data Summit North America. Coleman said 57% of travelers feel brands should tailor their experience based on their past behaviors. “Increasingly we are seeing customers are expecting, and even demanding, this type of customization,” he said. This growing power is becoming married to more powerful data connections. Verizon just announced its 5G Network that can power 10 gigabits per second. That translates to downloading an entire high-definition movie in less than one second, Pal said. Expedia allocates USD1.3 billion a year for technology and content spend as it focuses on becoming a mobile-first company, since one-third of its bookings come from mobile. It’s forays into technology currently encompass machine learning and artificial intelligence, virtual reality, and using voice technology with Amazon Echo: “Voice is becoming an important aspect of what we do. That will enable us to personalize. You want technology to know about your tastes. Alexa is going to offer that,” said Pal. Machine learning and artificial intelligence are quickly becoming the backbone of many innovative travel platforms, including Airbnb. “Airbnb is totally built in-house,” said Theresa Johnson, product manager at Airbnb. Machine learning is critical to the success of the short-term rental platform. It’s used at every step of the user experience, she said. The German accommodation market is in the midst of a strong period of high demand, with the number of overnights stays in German accommodation establishments with 10 or more beds rising from an estimated 436.4 million in 2015 to 459.6 million in 2017. Despite the recently buoyant market, 2018 will see hotel profits in the country under pressure as demand growth from German travelers slows, room supply increases and costs grow says a new report, an excerpt for which can be downloaded for free here. According to Hotstats data provided for the report, average room rates in Germany have been increasing, rising 2% year-on-year in 2016 and 2.5% in 2017 on the back of stable occupancy rates at around 75% across each of three years. This has allowed profitability to rise gently in those years but further gains will be difficult in 2018. The primary pressure on hotel profits will come from rising wage bills as the German market is experiencing the lowest unemployment it has seen since Reunification with no sign of suddenly increasing supply. Workers are also becoming more vocal about getting a higher wage packet, leading to labour disputes in several German states thus far in 2018. Competition for workers could be exacerbated even further by new hotels opening in Germany in 2018. Germany has Europe’s second largest pipeline of hotel rooms and the supply-side expansion will also put competitive pressure on hotel pricing in 2018. Pablo Alonso, CEO for HotStats notes that “Historically Germany has always been an attractive market for hotel investment due to the stability of headline performance levels, which provide a consistent income. On top of growing wage bills and expanding room supply, demand growth from domestic German consumers, who power the market, is likely to be softer as they rediscover their love of international travel and feel confident to book previously shunned destinations. Already in 2017 interest in outbound travel was rising and concerns about safety when abroad were diminishing notes the report. You can download an excerpt from the report by clicking here. Use this free excerpt from our German Travel Consumer 2018 Report to understand the trends shaping German destination choices and spending patterns both at home and abroad in 2018. Although digital travel bookings made through mobile are rising, a number of factors will mean Germans continue to rely on their desktops and laptops to look and book their trips says EyeforTravel’s new German Travel Consumer 2018 Report. The research expects continuing rises in smartphone usage during the booking journey as younger generations are more likely to use the device. However, even by 2020 the report expects roughly two thirds of digital bookings to still be conducted on desktops and laptops in the German market. A free excerpt from the report covering booking trends can be downloaded by clicking this link here now. This leaves mobile devices trailing desktops and laptops for users time as they plan and book their trip, especially when it comes to older generations. In a survey conducted for the report, just 0.6% of over 55s report buying their flight through a smartphone. In comparison, 29% reported making their flight booking via a face-to-face sale. Therefore, as well as Germany lagging behind other major markets for smartphone device usage in the travel journey, it will also shift relatively slowly due to consumer attitudes, demographic trends, infrastructure issues, and an established market of traditional travel agencies. You can download an excerpt from the report by clicking here. The excerpt includes data on digital habits, device ownership, cross-device movements, research behaviors, lead times, search terms, key research and booking points, social media engagement, and device usage rates both inside and outside the travel journey. What are the key trends will define the Chinese travel market in 2018? Alex Hadwick, Head of Research at EyeforTravel, and Gary Bowerman, Director of Check-in Asia, discuss what you should be keeping an eye on this year. Click here to view the full report on the Chinese travel consumer. 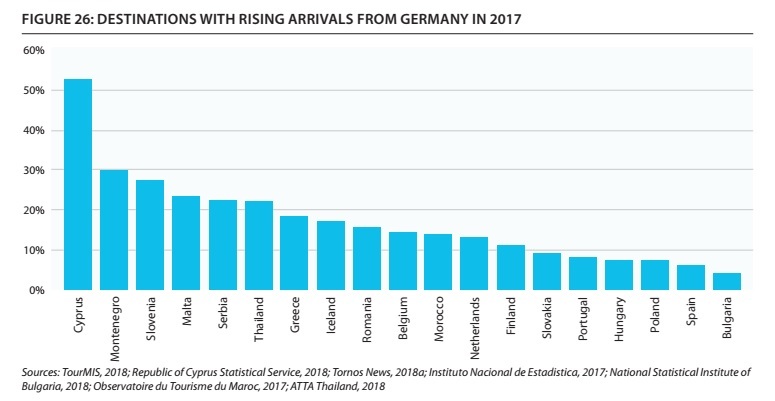 Germany’s outbound market accounts for over 30% of the overnight stays made by EU citizens but the market is set to get even bigger in 2018 on the back of strong economic performance, receding security concerns and high consumer confidence finds the report, an extract of which can be downloaded for free here. The research expects spending by Germans on international leisure travel to exceed €80 billion in 2018 as a result of renewed confidence among German travellers to travel further abroad and return to a variety of destinations, principally Turkey, alongside record high expectations of improving wages. This comes off the back of an improving environment in 2017 after setbacks in 2016. The report notes a much wider number of destinations reported good growth in 2017 than in 2016 and destinations previously in free-fall appeared to bottom out. Destinations reporting strong growth came from those close to home in Scandinavia, Belgium and the Netherlands, and further afield, Greece, and Balkan and Southeast Asian countries. In terms of where these trends will head in 2018, perennial favourites Italy, Spain and Greece will continue to be the most popular but Spain will see its growth rates hit by diminishing price competitiveness. Already more expensive than many destinations in the Eastern Mediterranean at the start of last year, average daily rates rose strongly in the market in 2017 and tourism-focused tax rates have further increased costs. Instead, Turkey seems set to experience double digit growth, German tour groups are returning to Tunisia, and Southeast Asian countries seem likely to continue recent high growth as Germans look at long-haul destinations more frequently. Turkey, Tunisia, Morocco, and Egypt will also be helped in 2018 by receding security concerns that have previously been at the forefront of German travellers minds. The report notes that polls have found that German fears of terrorism have decreased from its peak in 2016 and it is no longer the top concern. All of these destinations are seeing extremely strong early booking indicators in 2018 according to travel agents, who also report record confidence for growth in 2018. They are being helped by extremely strong economic indicators, particularly with regard to conditions for the average German consumer. Seasonally adjusted unemployment is at a post-Reunification low and consumer confidence is at a record high when it comes to expectations of wage increases. These expectations are not baseless, as the German labour market now has little excess labour to call on and German firms seem to be aware that wages must rise. Furthermore, German consumers have been reluctant to loosen their purse strings when overall European economic conditions have been poor and risks high, but this has shifted as of early 2018, with the eurozone reporting the best economic conditions since the Recession and renewed confidence. This will boost Germane travel consumer spending in 2018 and, barring an economic shock, mark it out as a vintage year for the outbound market. Soaring consumer confidence, a growing pay packet and a rising interest in travel will push German spending on leisure travel upwards in 2018 finds a new report from EyeforTravel. 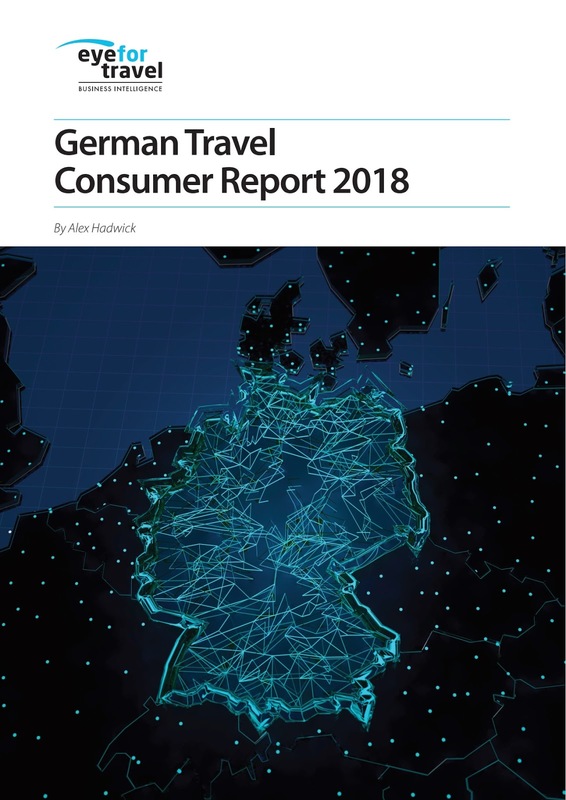 The German economy and consumer is in excellent shape in early 2018 and that means increased spending on travel in the world’s third largest outbound market says EyeforTravel’s new German Travel Consumer 2018 report, a free excerpt from which is available now. The German economy’s strength stretches across multiple measures. GDP growth has been consistently upgraded to a forecast of 2.3% in 2018, unemployment has retreated to a post-Reunification low and measures of consumer and business confidence are either just above or at record highs. Consumers are right to be confident as very low unemployment is creating an environment for strong wage growth, especially as consumers and unions are willing to ask for raises. Although real wage increases slowed down to 0.8% at end-2017 higher rates in 2015 and 2016, this should accelerate again, creating a strong environment for expanding spending on travel. Already in late 2017 there were signs of stronger growth in consumer expenditure and the travel vertical economy that will carry through to 2018. Germany’s trade surplus fell for the first time since 2009 even though export demand is very robust. This is a sign of quickly rising demand on the part of German consumers. This demand carries over to the German travel market, both domestically and internationally, with interest in travel among German consumers reaching a 10-year high as of late 2017. In 2017 the domestic market continued recent trends of solid expansion and the outbound market performed far better than in 2016. Furthermore, German consumers were helped in 2017 by the performance of the euro. The Euro Currency Index, which measures a basket of major currencies against the euro, had its strongest value growth in 14 years, and this should hold over to 2018, helping support German spending power abroad. This German spending power is already at the top of major European economies notes the report. In terms of Actual Individual Consumption (AIC) per capita, Germans spent EUR3,400 more than the European Area average of EUR21,100 in 2016 and in purchasing power standard, the average German household had around 19% extra disposable spending per year over the Euro Area average in 2016. Further growth in German pay packets in 2017 and 2018 will only strengthen German travel spending. The greatest areas of concentration of consumer spending power are to be found in the Ruhr, and major urban centers, such as Hamburg, Frankfurt, Stuttgart and Munich. While the overall number of German consumers who participate in leisure travel is expected to remain broadly stable at just under 80% of consumers according to the report, there is scope for increased spending. The report notes that older German consumers will be the key demographic in the medium term. This is due to those aged over 55 increasing in size as an economic cohort alongside their greater leisure time and growing wealth. The report’s consumer survey notes that those aged over 55 spent noticeably more than younger cohorts and were less concerned about budgetary considerations. Whereas a quarter of consumers under 35 reported spending less than EUR500 on their trip, just 14% of over 55s had such a low trip spend. This is no surprise as older Germans have done well in the current period of economic expansion. German state pensions experienced their biggest ever rise in 2016, estimated at 4% to 5%, and there were further increases of 3.6% in 2017. This means that travel brands need to keep a close eye on the German travel market over 2018. You can download an excerpt from the report by clicking here. This excerpt covers the state of the German economy, consumer and travel market in 2018. It includes economic performance data, consumer confidence outlooks, household wealth data, market sizing, spending analysis, and currency data.